Thinking About Buying or Selling a Small Business? HomeBrowse LibraryInfographic: Thinking About Buying or Selling a Small Business? Ever thought about starting a business but weren’t sure if you wanted to build one from the ground up? Buying a business could be the best way to fulfill your entrepreneurial dreams. Our new infographic, “It’s a Great Time for Buying or Selling a Business,” looks at how small businesses change hands in the United States. The price of purchasing a business is rising -- and that’s good news for anyone considering selling. Last year, businesses tended to sell for just $25,000 lower than their asking price. 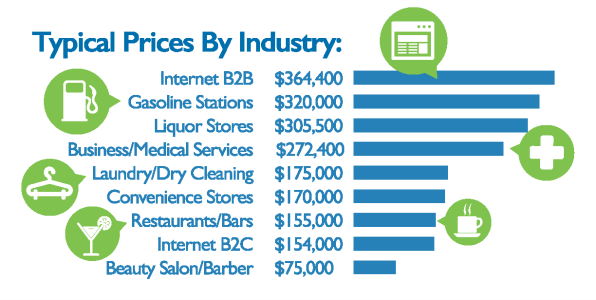 Internet B2B companies cost the most to buy, so be prepared with about $365,000 if you’re in the market for one. Meanwhile, you can likely buy a dry cleaning shop, restaurant, convenience store or barber shop for under $200,000. In fact, restaurants accounted for 22 percent of business sales in 2015, the highest of any industry. Thinking about selling your business? Don’t wait until the last minute -- start doing your research and planning for sale two to five years in advance. Be sure to review your finances, as 31 percent of brokers surveyed reported bad financial health as a major reason why businesses don’t sell. Check out the infographic for more details. If you’re considering buying a business or selling one you’ve built, contact a SCORE mentor. These seasoned volunteers can guide you through the process -- and may have personal experience to share!